Our individual and group tours are custom designed to cater to each traveler's specific desires and interests. Tell us what you'd like to do and where you'd like to go and we'll arrange a complete itinerary for you. There are no services we do not provide in Odessa! Car transfers from/to Odessa Airport or Train Station, Interpreting, Guide support, Odessa Apartment or Hotel accommodation, booking local bus, train or plane tickets, booking opera/theatre tickets, reserving tables at Odessa restaurants or night clubs and much more! Just let us know what services you need and we'll arrange your trip to Odessa and other Ukrainian, Russian or Moldavian cities the way you want it! Odessa is a great place where anyone can find something new every day and for those who want to know more - we arrange individual or group excursions those leave unforgettable memories about Odessa for the whole life. Just go through the list of available excursions and you'll come to a conclusion that Odessa is worth a visit! We are committed to providing you with the best service and with complete satisfaction! 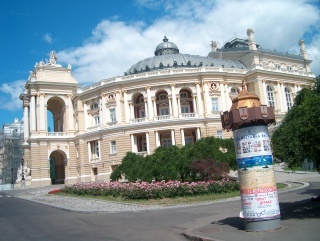 Since its foundation, Odessa has been a cosmopolitan city. Big communities of Greeks, French, Polish, Italians, Jews, Russians, and other people have existed here. You will see streets bearing their names with beautiful houses built by Italian architects about 150 years ago. The tour features the Opera House, which is the second best in Europe, the massive Potemkin stairs, beautiful palaces and churches. You will see historic monuments to Deribas, Catherine the Great, The Duke de Richelieu, and Lenin. You will surely visit our unique gardens full of mini sculptures, the Arcadia beach, and other interesting places. In addition, you will hear fascinating stories about every person and every building, which catches your eyes. Nowadays Odessa stands on three layers of sandstone catacombs, which form the longest - about 1000 km - man-made labyrinth in Europe. They appeared as a result of quarrying out the building material for the buildings in the 19th century. In different times, the catacombs were used by smugglers, robbers, revolutionaries and guerrillas. 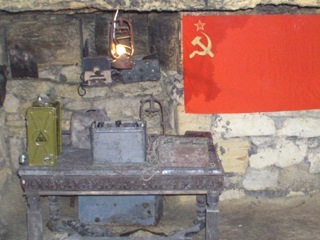 Since the 60s of the 20th century, the Museum of Partisan Glory has existed in Nerubayskoye village near Odessa where the partisans used to have their headquarters during the 2nd World War. Belgorod-Dnestrovskiy is one of the oldest cities in Europe being about 2500 years old. It originated from the ancient Greek colony of Tira and has had a long and interesting history ever since. Nowadays this small town has a lot of places worth visiting: a huge medieval fortress, a 13th century Armenian church, a 16th century Greek church with a holy spring and the Greek cathedral, possessing a fine collection of old Greek icons. You can visit the local Museum to see its archeological artefacts or have a pleasant and delicious open-air meal at The Argo Restaurant. The Greeks, the French, the Polish, the Italians, the Jews, the Russians, the Germans, the Ukrainians, the Turks and others - all these people have lived in Odessa and in the nearby area since the very beginning of the history of this city. Naturally, all of them needed to practice their respective religion. So nowadays, there are Russian Orthodox, Catholic, Greek, and Armenian churches, as well as a mosque and two synagogues. There are also a Convent and a Monastery with a theological school. At the beginning of the 20th century, Odessa was known as a city where famous criminals lived and "worked". One of them, Mishka Yaponchik (Mike the Jap), who lived in the early 20th century, was said to have robbed the audience at the Odessa Opera house in just thirty minutes. He was the leader of a whole army of thieves, burglars, and pickpockets numbering about 10.000. His slogan became widely-known and repeated "A lot and immediately!" His personality was so popular that he was introduced into fiction by Odessa writer Isaac Babel. 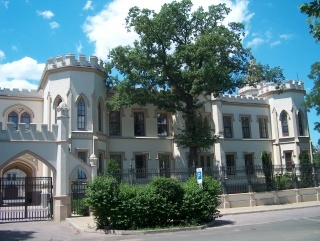 During this tour you will have a chance to see places in Odessa connected with the biographies of famous criminals, find out about their lives and the notorious heritage they have left. During this tour, we will show you the places connected with the activity of pirates in the Odessa region. You will see a meeting place of pirates and free masons, a grotto, and the catacombs under the palace of a Russian aristocrat and a daughter of one of the most beautiful women in Europe, Sofia Polotskaya. You will see a pirates' nest where women were kept before being taken to Istanbul to the slave market. We will disclose a secret of Prince Gagarin's palace. At the end of the tour, you will see a place were a retired pirate, Iron Gugo as he calls himself, lives, and listen to his stories of the glorious past. You cannot enter his residence unless you are wearing a pirate's costume and take a pirate's vow. There you will find a place to sing pirates' songs and dance if you wish to do so. The town of Vilkovo is situated at the mouth of the Danube River and was founded in 1746. It is built on silt and sand islands and that is why it is often called "the Ukrainian Venice". The trip to Vilkovo by car takes about 3.5 hours. 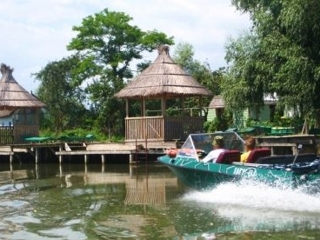 Excursion includes a tour around the old town and a motorboat excursion to a picturesque island down the Danube River where you will have a traditional Ukrainian picnic lunch. There you can also bathe in the Danube River and bask in the sun in a cozy fruit orchard sipping wonderful local red wine or drinking aromatic tea. This trip is a must for nature lovers! We look forward to assisting you as one of our valued clients!